GW Instek debuts the PSB-1000 series, which is a single output channel, programmable and multi-range DC power supply. The series comprises 400W models: PSB-1400L(40V/40A); PSB-1400M(160V/10A), and 800W models: PSB-1800L(40V/80A); PSB-1800M(160V/20A). The maximum voltage output of 320V can be realized by placing 160V units in series connection. By connecting PSB-1800Lunits in parallel, the maximum current output of320Acan be achieved. 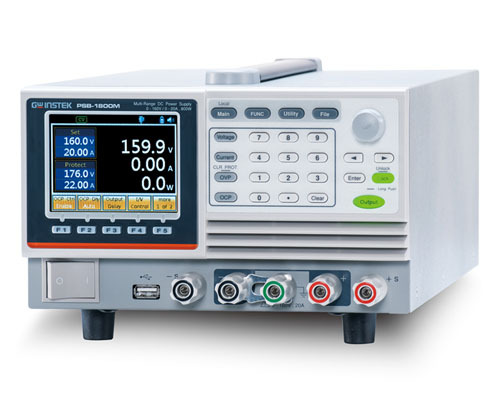 The PSB-1000 series is a bench-top power supply featuring user friendly interface, which can clearly display setting conditions and measurement results via LCD display and menu-typed functionality selection without referring to the user manual. All settings can be done by functionality keys, numerical keys, and speed dial keys. The30Aoutput capability from the front terminal of the PSB-1000 series can better meet the requirements of laboratories and scientific R&D units. The PSB-1000 series features user friendly menu-typed functionality interface and its built-in functionalities can better meet industry's application requirements. Both front panel and rear panel output terminals of the PSB-1000 series facilitate researchers to access power output conveniently. The display panel adopts menu-typed functionality selection to help users quickly familiarize with settings and operation that is extremely suitable for on-site engineers and R&D engineers who deal with complicated functional setting requirements. The Bleeder function helps rapidly bleed internal capacitors to avoid potential danger of discharging electric charge. For battery's charging applications, users can set Bleeder to Disable to avoid impact on battery charging applications. The I/V Control function, based upon DUT's requirements, sets rise and fall speed of voltage and current respectively to effectively reduce surge voltage and current output as well as to measure DUT characteristics. The CC priority output mode can be utilized to protect diode characteristic load and LED load from being damaged by inrush current. Sequence Function (SEQ), via editing Excel charts and uploading them to the instrument, automatically executes the required output waveforms to meet the requirements of related regulations and tests. The automatic execution of the sequence function is often applied to planning a set of continuous voltage variation to assess DUT characteristics. For instance, producing a series of voltage variation output to test impact on automotive fans is one of the reliability test applications. Power On Configuration allows users to select previously set SEQ to carry out automatic execution as soon as power is turned on. For production lines demanding sequential power supply output application requirements, tremendous time can be saved by this function, which exempts users from resetting sequential power supply when power is turned on every single time. Voltage Trigger allows users to set pulse signals for leading edge threshold and trailing edge threshold. VOLT TRIG can be applied to ATS by providing output time for working voltage via BNC adapter. The Output Delay function facilitates users to respectively set action time for power output on and power output off for multiple sets of PSB-1000 so as to realize sequential power output applications. To augment output power so as to meet customers' large voltage and large current requirements, the PSB-1000 series, via placing two same model units in series connection, will be able to produce twofold rated voltage output, and through connecting four same model units in parallel, the PSB-1000 series can produce fourfold rated current output. The maximum voltage output of 320V can be achieved via placing the PSB-1000 series in series connection, and the maximum current of 320A and the maximum power of 3200W can be obtained through parallel connection. The PSB-1000 series provides different Power On Configurations for different users. Users can also set automatic execution procedures to be carried out as soon as power is turned on. After presetting Power On Configuration, each rebooting will have a short activation display to show present settings of Power On Configuration of the PSB-1000 series. The execution will be conducted by the power on mode. set High to indicate pin18-19 open circuit (Open) power output. set Low to indicate pin18-19 short circuit (Short) power output. The On/Off of the OCP protection function can be selected from the master display screen and the OCP activation time can delay 0.1~2.0 seconds. This function can protect customers' DUTs from over current to avoid unexpected operations which lead to DUT damage caused by over current. Voltage Trigger allows users to set pulse signals for leading edge threshold Vt1 and trailing edge threshold Vt2. VOLT TRIG can be applied to provide output time for working voltage via BNC adapter. Users can determine positive or negative voltage trigger signals by Tref. Power output and on/off facilitate flexible planning and setting with respect to time. CV and CC priority can be set based upon customers' application requirements. The speed of voltage rise (V/s) or voltage fall (V/s), and the speed of current rise (A/s) or current fall (A/s) can be set respectively. The PSB-1000 series provides customers with the following four modes to meet their requirements. The PSB-1000 series power supply has a bleeder circuit control which is in parallel with the output terminal. When power is off or load is disconnected, bleed resistor will consume electricity from the filter capacitor. Without a bleed resistor, the filter capacitor of power could still be charged with electricity that poses a potential danger. In addition, for ATE system, bleed resistor allows the PSB-1000 series to bleed current rapidly so as to prepare itself for the next operation. Allow users to decide measurement average to be output based upon the requirements. Under Low level, the real time average can be displayed. On the contrary, under the High level, the higher average will be displayed. There are 10 sets of the Sequence function for customers to determine record settings. Automatically executing sequential waveforms can be done without the PC. For instance, sequential power output simulates the power supply of DUT's aging battery to understand the impact on DUT's characteristics. On the rear panel of the PSB-1000 series, a 26-pin analog control terminal is designed to perform remote control and monitoring functions. External voltage or resistor can be utilized to set output voltage and current. The power supply output on/off control and master power shut-down can also be controlled by using the external switch. The analog control terminal is complied with the Mil 26-pin connector (OMRON XG4 IDC plug) standard. Copyright ⓒ topsi.co.kr All rights reserved.